Simon Lambert after breaking his hand in a crassh. Photo: David Lowndes. He wanted a miracle, but Peterborough Panthers promoter Ged Rathbone got a disaster instead. Not only did the city team failed to salvage any pride from their Premier League KO Cup quarter-final clash against Somerset at the East of England Showground yesterday (July 3), they also lost a red-hot rider to injury. Craig Cook in action for Panthers against Somerset. Photo: David Lowndes. Panthers went down 38-52 in the second leg to complete a miserable 114-66 exit on aggregate which was made all the more painful by the loss of Simon Lambert to a broken hand. Lambert was involved in a heat three crash when he slammed into the back-straight fence having inadvertently clipped the machine of partner Nikolaj Busk Jakobsen. An hour-long delay followed as Lambert, who also sustained concussion and a badly swollen right knee, was treated at the track before a second ambulance arrived to transport him to hospital. He is now likely to be sidelined for anything up to eight weeks and will be sorely missed by a team suddenly struggling for points again. Emil Grondal in action for Panthers against Somerset. Photo: David Lowndes. Lambert’s early departure was undoubtedly a factor in a third home defeat of the season as his remaining rides had to be taken by reserves, but team boss Jason Attwood was determined not to use it as an excuse for a sub-standard showing from his side. Panthers managed only six race-winners and two heat-advantages while producing a scorecard littered with 10 last places in addition to Lambert’s exclusion for his spill. Attwood said: “It was a huge blow to lose Simon after a really nasty crash and we’ll certainly miss him because he has been on fire lately. “But I’m not going to put the defeat down to that. We carried too many passengers and the performance was quite simply not good enough. “We really wanted to put on a show after losing so heavily down at Somerset in the first leg, but you only have to look at the scorecard to see the problem. There are zeros all over it and that is never going to be a recipe for success. “No-one turns up to ride poorly, but it is safe to say we expected more from certain individuals and the team as a whole. “The guys are well aware of that and we need to make sure we put this KO Cup tie behind us and come back firing in the Premier League. Panthers were already behind when Lambert was hurt after Craig Cook had been beaten by rival number one Josh Grajczonek in heat one. That was one of three defeats suffered by Cook who had dashed back by road and sea from northern Italy after competing in a World Championship semi-final qualifier the previous night. 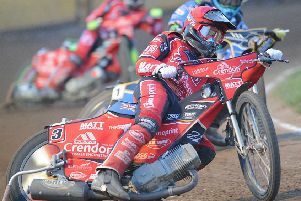 Cook still managed to pile up 12 points to top the Panthers’ scorechart while Busk Jakobsen provided the sturdiest support with a couple of wins in a nine-point haul. He was unlucky not to reach double-figures after being mugged on the line by flying Somerset reserve Jake Allen for second spot in a ninth heat re-run. That was the first of two Rebels 5-1s in the space of three races that put the meeting beyond Panthers – the other arrived in similar fashion in heat 11 as the previously unbeaten Ulrich Ostergaard was pipped by a late Bradley Wilson-Dean charge to the line. Ostergaard and Busk Jakobsen had earlier collected the wins that inspired Panthers’ two advantages. They arrived in successive races in heats four and five to very briefly draw the hosts level, but they were soon behind again and the arrears grew as the meeting progressed with KO Cup holders Somerset sauntering to their fifth successive victory at the Showground. Panthers don’t return to action until Tuesday, July 12 when they host Scunthorpe in the first of two Premier League home dates in the space of four days. Berwick then arrive at Alwalton on Friday, July 15. Club chiefs are likely to have to dip into the rider market to replace Lambert before then. PANTHERS: Craig Cook 12, Nikolaj Busk Jakobsen 9, Ulrich Ostergaard 7, Emil Grondal 6+1, Zdenek Holub 4+1, Tom Perry 0, Simon Lambert (withdrawn) 0. SOMERSET: Rohan Tungate 12+1, Josh Grajczonek 11, Jake Allen 9+1, Charles Wright 8+1, Paul Starke 7+1, Bradley Wilson-Dean 4+1, Connor Mountain (guest) 1+1.